Readers will recall my January 26 posting and my February 4 posting about the consequences of the decision on January 15 by the Swiss central bank to allow the Swiss Franc to rise to its natural level after over a year during which the bank had sought to cap the percentage difference between the Swiss Franc and the Euro. The Swiss Franc jumped 15 to 20 to 30 percent relative to various other currencies. I predicted that the International Bureau would seek to revise the “equivalent amounts” for the PCT international filing fee and other PCT fees payable to the International Bureau and would seek to make the revised fees effective much sooner than the usual delay of 3-4 months. Now the new fees have been set and indeed they will take effect sooner than the usual delay. The weather reports for the Washington area call for “six to ten inches of snow” between now and noon on Tuesday. So the USPTO will be formally closed on Tuesday, February 17. This means that if you needed to file something on the 17th to satisfy some USPTO due date, it will be timely if filed on Wednesday the 18th. When the new fifteen-year design patent term takes effect? In a recent blog post I said that May 13, 2015 will be a big day, and one of the reasons it will be a big day is that design patents granted from applications filed on or after that day will enjoy a fifteen-year term. This is a longer term than the fourteen years with which we are familiar. Here is a countdown to the date (May 13) when the US will belong to the Hague Agreement. Just a reminder that the USPTO will be closed on Monday, February 16. This is Washington’s Birthday* which is a federal holiday. Anything that you might need to do by February 16 to satisfy some USPTO due date may be postponed until Tuesday, February 17 and will still be timely. May 13, 2015 is an extremely important day for US design patent filers. Why? Because if you are smart about May 13, you can get a US design patent with a fifteen-year patent term rather than a fourteen-year patent term. The Hague Agreement is the international filing system for design protection that corresponds to the PCT filing system for international utility patent protection and the Madrid filing system for international trademark protection. The progress of the United States toward membership and participation in the Hague Agreement has been slow and at times tortuous. As I blogged here, President Clinton signed the treaty in 1999. Many years passed before the Senate ratified it in 2007. Congress needed to pass enabling legislation which finally happened in 2012. Next the USPTO needed to promulgate proposed Rules, which it did in 2013. The next important step was for the United States to deposit an “instrument of accession” to the Agreement with WIPO. Interestingly somehow the United States and Japan managed to coordinate their efforts, and the two countries deposited their instruments of accession on the same day, Friday, February 13, 2015. You can see WIPO’s press release here. And at right is a photograph (courtesy of WIPO) showing the historic event. 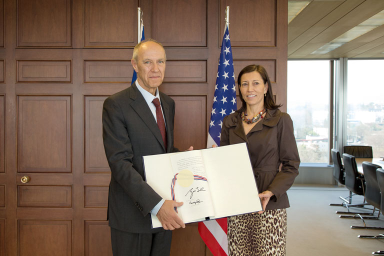 You can see US Ambassador Pamela Hamamoto handing the Instrument of Accession to WIPO Director General Francis Gurry. Almost daily I will encounter some patent practitioner or patent firm or corporate patent department that uses PCT but that fails to make use of ePCT. Of course when this happens I encourage the patent practitioner or patent firm or corporate patent department to start using ePCT. I imagine this to be a bit like the dentist who encourages people to brush and floss, sometimes feeling discouraged with the realization that some will not follow the advice. Now comes another series of webinars from WIPO explaining how to use ePCT. Within our office we try to track our PPH cases pretty carefully. This prompted my recent blog postings here and here and here about the recent substantial worsening of the backlog within the USPTO in considering requests for PPH status. After months of no progress USPTO has managed to grant a few of our long-pending PPH petitions, and so we have some hard data as just now bad the backlog is in recent weeks. Readers of this blog will recall that the Board of Directors of AIPLA adopted a resolution urging the USPTO to give substantial deference in a US national-phase application to the work done earlier by the USPTO in its role as International Searching Authority and International Preliminary Examining Authority. AIPLA then wrote a letter to the USPTO about this. I call this (not AIPLA’s terminology!) inviting the USPTO to “drink its own Champagne”. I blogged about this. What happened next?